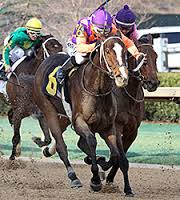 – 1st Star: Sea N Suds (AR) – It was Arkansas Bred Stakes week at Oaklawn, and Sea N Suds stole the show on Sunday winning the Rainbow Stakes by a nose. After a tough trip from the rail, Sea N Suds was able to get to the outside down the stretch and wear down Devilishly Clever and He Is a Roadster. For the third straight race the horse demonstrated toughness and heart, two qualities that are great to have no matter what state you were bred in! With Kelly Von Hemel as trainer, you would think Prairie Meadows will be the next time we see this one. – 2nd Star: Delta Flower (AR) – She was the easiest of winners Saturday in the Rainbow Miss Stakes, as she broke sharp and never looked back winning wire to wire by almost four lengths. The race just confirmed her talents, as the race before was a blowout maiden score. This one might have enough talent to try out-of-state company next time out if they can find the right spot. – 3rd Star: Mallard’s Bro (AR) – He may be our third star, but there is no doubt his win was the most dramatic of the week! After hanging out toward the back of the back the entire race, Mallard’s Bro gained momentum in the stretch, and was just able to nose past Devil and a Half at the wire. The win was his first in three tries this year, and it was his first win ever at Oaklawn. He’s now earned over 100k for his career, and will most likely resurface at Louisiana Downs next time out. 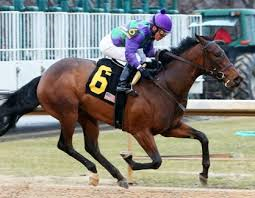 – Trace Creek (AR) – He ended up being the favorite in the Arkansas Breeders’ Stakes on Friday after a ton of hype, but in the ended he was a well beaten 9th. Considering you don’t get many chances to run against Arkansas breds once Oaklawn closes, this one has to be disappointing to the connections. – 1st Star: Brewing (FL) – Isn’t it strange that Brewing became the first D Wayne Lukas three-year old to earn our first star of the week? If I would have told you that before the meet I probably would have been laughed at by everyone, including his trainer! However, Brewing has come on in a big way at Oaklawn, winning a maiden race and then the Gazebo Stakes in easy wire to wire fashion. 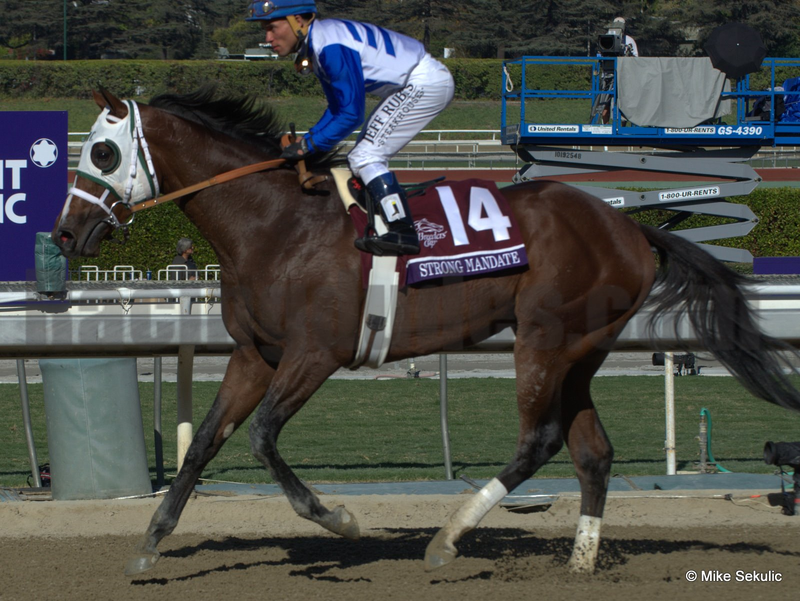 His running style suggests six furlongs could be his limit, and it looks like the Bachelor Stakes on closing weekend is where he will be pointed to next. – 2nd Star: Glacken Too (FL) – This one hasn’t run a bad race yet, although his Sunday allowance win was definitely the best race of his young career. The win was in wire to wire fashion, as he pulled away from all competition late to win by just over two lengths in the end. Just like Brewing, a race like the Bachelor or Northern Spur Stakes could be a nice fit for this horse next time out. 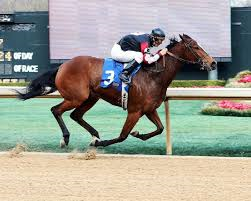 – 3rd Star: Jake Mo (KY) – Jake Mo certainly is no stranger to Oaklawn as he ran in the Smarty Jones, Southwest, Rebel, and Arkansas Derby in 2012, and also ran here twice in 2o13. What he has been a stranger to at Oaklawn is the winners circle, but that changed Friday when he won the feature race of the day. The win gives Jake Mo two wins in a row, and now he could be pointed back to stakes competition next time out. He had went a long time in between wins, but has found his form once again. 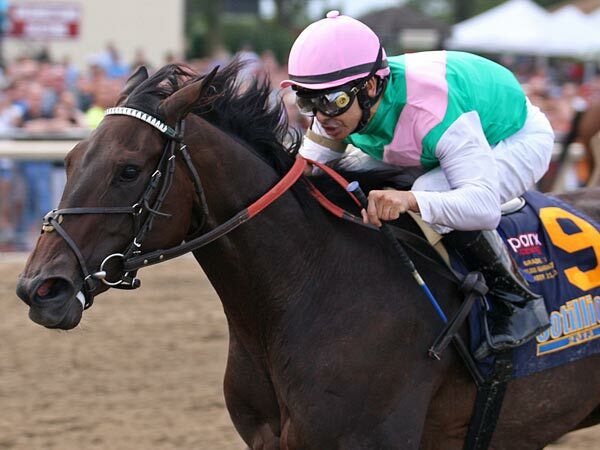 – Dunkin Bend (KY) – His seventh place effort in the Gazebo Stakes this Saturday was very disappointing, especially considering the fact that projected heavy favorite Boji Moon had scratched from the race. After the race is was found that Dunkin Bend has a breathing issue that will require surgery, so that explains the poor effort. Still, he’s no doubt the flop of the week. – 1st Star: Close Hatches (KY) – She shipped in and stole the show from the three year olds! Sometimes horses struggle with the Oaklawn surface when shipping, but Close Hatches proved to be a champion Saturday when winning the Azeri Stakes and turning back several worthy challengers in the stretch run. When you consider her race record, and also considering when she did lose last year it was to some seriously good horses, this one could be turning into a super star. You’d think they’ll come back now for the Apple Blossom, and unless someone ships in with some serious class it could be lights out for everyone else who enters. – 2nd Star: Hoppertunity (KY) – It’s a Rebel Stakes that we’ll be talking about for a long time, but through all the bumping, grinding, and controversy it was Hoppertunity who came out on top. Is Hoppertunity the best horse moving forward? That’s certainly up for debate, but it also doesn’t matter when it comes to this particular race. All the credit must be given to jockey Mike Smith for this one as he made things as difficult as possible for Tapiture and jockey Ricardo Santana Jr. Santana rode a brave race himself, but the veteran Smith did just enough to make the difference. Hopefully we’ll see the top four finishers of this one all come back for the Arkansas Derby. – 3rd Star: Golden Lad (KY) – Pletcher’s success at Oaklawn isn’t as strong as many of the other tracks he comes too, but Golden Lad broke that trend as he dominated the Razorback Handicap over a field that looked evenly matched. The field is probably not the best Grade 3 you’ll find, but it still included several horses that like Oaklawn and were highly touted. Who knows where he’ll pop up next, it could be virtually anywhere. It would be nice to see him back in a month to run in the Oaklawn Handicap…but will he come to challenge Will Take Charge? – Govenor Charlie (KY) – He was bet down to the 2-1 favorite and thought of by most as being the better of the two Baffert horses that had shipped in for the weekend, but Govenor Charlie didn’t run a step in the Razorback step. He was out-ran from the beginning, and never got into the race at any point. With the track starting to play strangely his connections could point to that as an excuse, but to me it looks like he’s not a true two turn horse. NOTE: The betting amounts posted are what I would personally use. You may want to raise or lower the amounts suggested to better reflect the bankroll you will be working with. Don’t bet the rent money!! Analysis: The team of Taylor Rice and David Jacobson have been hot at Aqueduct, and this one ran a pretty solid second here last time out. Could be a nice bankroll builder to start out the day. Analysis: Two Richard horses here…hard to not take a shot with these two. Even money would still be playable, but keep a close eye on the price. With these powerful connections the odds could go down quickly. Analysis: Was third last time in his first try over the Aqueduct surface after winning the race before at Gulfstream. Enters in a similar level today, and might be better equipped to handle the track. Analysis: Russell Baze always wins the opener at Golden Gate! All systems set on go here, but much like the Richard horses at Oaklawn, you have to worry somewhat about the odds. Even money is playable, anything lower is dicey. Analysis: It’s that time of year at Oaklawn where Asmussen makes his presence felt, and he has several live horses on the card. This horse was a solid second last time out so we know he gets over the Oaklawn track ok. Analysis: He returns to Santa Anita today after running a terrible sixth at Golden Gate last time out. This track seems to be to his liking and he’s back to the level he runs best at. Hopefully that poor last race gives us a decent price. Analysis: In this race is the highly anticipated 4-year-old debut of Big Lute, but Hobby isn’t great with horses off a long layoff so I do believe he’s beatable today. Justa Runner looks like the right horse to beat him with, and should be a decent price. Analysis: She’s in the capable hands of Brad Cox and has been knocking on the door lately. This should be the right group for her to break through today. Analysis: Just a solid Louisiana runner who has solid connections. Analysis: Big time class dropper and Stevens stays on to ride. That’s enough for me to take a shot. Analysis: Winner of six straight races and morning line of 9/2?? This will be a jump up in class, but he’s worth an across the board wager today. We’ll see if his Delta, Fair Meadows, and Will Rogers form can translate to Fair Grounds. Analysis: Field of ten here makes this one likely to be a decent price, and will also make for a bigger place payout if we’re lucky. A lot of times a huge price comes in with favorites finishing second at Delta. If that’s the case here, this wager will still be profitable. Analysis: This one is very close to being the best bet of the day, and we could find some value in the other three races. Since #2 Little Face is sure to be a short price in race 9 we can’t make money on him with straight wagers, so why not take a swing and pair him up with some price horses in the late pick four. – 1st Star: Work All Week (IL) – All this guy does is win races! Saturday’s Hot Springs Stakes was his first Stakes race outside of Illinois bred company, but that didn’t matter as he scored a decisive win over a fast closing Alsvid and Apprehender. The win makes this horse an incredible nine for eleven lifetime, and a winner of six straight races. Now that he’s passed this latest test, you’d have to think graded stakes company could be next in the Count Fleet Handicap at Oaklawn during the Racing Festival of the South. – 2nd Star: Euphrosyne (KY) – It was a wild running of the Honeybee Stakes this Saturday, and in the end it was Euphrosyne who got the money via a disqualification of Sugar Shock. Sugar Shock looked like she was going to be the winner deep into the stretch, but then took a severe right turn and nearly ran over Euphrosyne, which made for a clear decision for the stewards. It was one of the more curious stretch runs in race history, and could set up for an interesting rematch later on down the road. However for now, Euphrosyne sits atop the leader board of Oaklawn three-year old fillies. – 3rd Star: Carve (KY) – What a comeback race for Carve! The hard knocking honest horse had a nice 2013 running well in several graded stakes races, but Sunday’s allowance win at Oaklawn may have been his best race yet. It’s clear the horse has improved since last uear, and you have to wonder if a race like this one could spring-board him into the Oaklawn Handicap next time out. The waters would obviously be deeper in that one, but after his last race it’s clear that he could be ready for the challenge. – Taris (KY) – The Maryland shipper came in hyped, and surprisingly the tote board hinted that she was more highly thought of than Florida shipper Please Explain. Neither of the shippers were able to get the job done in the Honeybee, but Taris was by far the lesser of the two. After seemingly having a perfect trip up front, Taris faded badly and finished sixth. Maybe the class jump was too high, or perhaps she didn’t handle the track. Either way, it was a big disappointment for a highly thought of horse. – 1st Star: Valid Commander (AR) – The Nodouble Breeders’ Stakes was the only stakes race carded this weekend at Oaklawn, and it was Valid Commander who made the most of his opportunity to shine. He was able to take advantage of a fast speed duel out front between Humble Smarty and Mallet, and got the perfect stalking trip to win by a length at odds of 8-1. Even though this was an Arkansas Bred Stakes race, the time was fairly fast so perhaps Valid Commander could be finding his groove. The win was his second in a row, and first stakes win of his career. – 2nd Star: Back Forty (KY) – Thursday’s feature allowance race could have been the toughest race of the week, but Back Forty was able to handle the field nicely to win by three-quarters of a length over Frederico. Back Forty has now won three of six races at Oaklawn, which easily looks to be his favorite track. 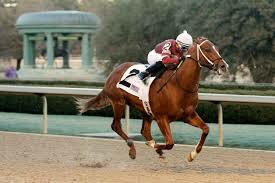 Look for him in another Oaklawn allowance next time out, or perhaps a small stakes at Delaware where he also excels. – 3rd Star: Adrianne G (KY) – After finishing fourth in a Stakes last time out at the Fair Grounds, Adrianne G returned to allowance company at Oaklawn Saturday was victorious for the third time in four starts. She held a perfect stalking position early on, and was able drive clear with ease in the stretch to win by a little over one and half lengths. The win could propel her into Stakes company again next time out. – Bull Dozer (FL) – The local fan favorite couldn’t put on a show for all his fans on Thursday, as he was the well beaten heavy favorite in the feature allowance race. The track was playing strangely on Thursday which could have caused some problems. You can bet he’ll regroup and will probably be backed pretty well next time out. – 1st Star: Aireofdistinction (KY) – Even though Oaklawn only had one stakes race this week, Aireofdistinction made it count! Race caller Frank Mirahmadi pretty much gave up on her at the top of the stretch, but out of nowhere Aireofdistinction re-rallied and took the Spring Fever by a nose over Chortle in a photo finish. The win gives Aireofdistinction four victories in a row, and could propel her into a graded stakes try next time out. – 2nd Star: Donoharm (KY) – Last year’s Fifth Season and Essex winner was back in the winners circle Sunday, winning an allowance race by a length and a half over Flashy Sunrise. It’s a win that is long over due as his form hasn’t been great since those two big wins last year. Perhaps he’s back on track now, and could possibly be pointing towards a run in the Razorback or Oaklawn Handicap next. 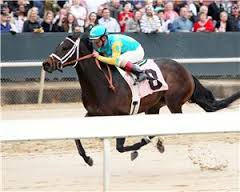 – 3rd Star: Unstoppable Colby (KY) – The Lukas/Zayat team has been hot this of late at Oaklawn, and the maiden special weight win by Unstoppable Colby might be the most significant. Thursday’s mile and one-sixteenth victory came in wire to wire fashion as he turned back two hard closing rivals to win by a little less than a length. We know he’ll be in a stakes next time out, it’s just a matter of which one they choose. We’ll see if his second attempt to earn derby points works out better than his first. – Broken Blues (KY) – It’s probably a little unfair that she lands in this spot, but there really wasn’t any other horse to put here this week. Broken Blues was a disappointing favorite in a Thursday allowance race, but may have simply been a little outclassed. We aren’t going to give her too hard of a time for that performance. – 1st Star: Tapiture (KY) – The first major step towards Kentucky was taken Monday as Tapiture looked like the real deal winning the Southwest by four and a half lengths over Strong Mandate. Jockey Ricardo Santana was able to give him a dream trip as he broke well and saved all the ground racing along the rail the entire race. The win makes him a two-time Graded Stakes winner, and should set him up for the Rebel and Arkansas Derby as we go down the Triple Crown Trail at Oaklawn. – 2nd Star: Don’t Tell Sophia (KY) – As expected Don’t Tell Sophia was dominant once again this Saturday. She’s winning races like a freak right now, but can she keep doing it when the competition gets a little steeper? She’s simply in a class by herself when it comes to the older fillies and mares on the Oaklawn grounds right now. However, On Fire Baby is getting closer to race which could make the Azeri Stakes very interesting in March. – 3rd Star: Apprehender (KY) – On any other week this would have been the performance of the week! Coming off a ten month layoff Apprehender was able to put away a stellar field and win the King Cotton Stakes in an eye-popping time of 1:10 flat. Apprehender has always shown a lot of class, but showed a bit of maturity for the first time Saturday as we was able to sit behind horses and save his energy for the stretch run. The win makes it two King Cotton’s in a row for the horse, and puts him on path for the Grade 3 Count Fleet Handicap at the end of the meet. – Win Willy (KY) – Very sad that this horse ends up here. The Oaklawn legend was dead last in the Essex Stakes Saturday, and never showed any interest the entire race. Obviously should have been retired after last year, but Win Willy has been thrown into the fire once again only this time it looks like he’s given up. – 1st Star: Aragorn Ami (ON) – She came to Oaklawn with just one lifetime race, but that’s all she needed! Aragorn Ami captured the first of three Kentucky Oaks prep races at Oaklawn, as she took the Martha Washington by a length. Considering this was only her second lifetime start you would think that leaves room for a little improvement as well which is even better news for all her connections. With the filly race being wide open this year, Aragorn Ami has tossed her name into the discussion moving forward. – 2nd Star: Boji Moon (IA) – This was just a ridiculous performance! After trying to stretch Boji Moon out a couple of times, trainer Chris Richard entered him back in a six furlong race and it worked out very well. Even though he was facing older rivals, Boji Moon was dominant in winning an allowance race Saturday as he easily won while completely in hand. You would have to think the race sets him up for Stakes company next time out considering he left plenty in the tank in this race. Oaklawn has a couple of shorter three year old stakes that he could be looking at down the road. At the six furlong distance it will be hard for anyone to beat him. – 3rd Star: Right to Vote (KY) – Friday’s feature contained three horses that have won Stakes races at Oaklawn in the past, but it was Right to Vote that ended up getting the money in a stylish performance. The win was his first at Oaklawn in three tries, but more importantly the win came around two turns. That means Right to Vote has thrown his name into the older male division mix at Oaklawn, with races like the Essex, Razorback, and the Oaklawn Handicap within his reach. The emergence of Right to Vote gives trainer Ron Moquett a duel threat in the older male division as he conditions top sprinter Gentleman’s Bet as well. – Kiss Moon (KY) – She came into the Martha Washington undefeated, and was bet down to favoritism, but was a complete no-show finishing seventh. Maybe she bounced a bit off that nice performance on opening weekend, or maybe the competition got to her. You should never give up on a three-year old this time of year, but she’ll need to show a lot more next time out. BEAUTY SISTERS is a first time two year old for Wesley Ward which is enough for us to give her a big shot at winning today. When a West Virginia-bred finally captured the $1 million Charles Town Classic Stakes (G2) at Hollywood Casino at Charles Town Races, it was altogether fitting that Runnin'toluvya filled that role. A change in surfaces from one month to the next resulted in an all-out rout April 20 by Cistron in the $200,000 Kona Gold Stakes (G2) at Santa Anita Park. After posting a pair of wins at Fair Grounds this year, Shakopee Town made her Woodbine debut a winning one in the Whimsical Stakes Presented by Irish Thoroughbred Marketing (G3) for older fillies and mares. Making the 40th start of his career April 20 at Keeneland, the 8-year-old Badge of Silver gelding took home the $250,000 Dixiana Elkhorn Stakes (G2T) with a perfectly timed run under Tyler Gaffalione. Santa Anita Park and the Thoroughbred Owners of California will increase purses for all non-stakes races through the next six weeks, the track announced April 20. Medallion Racing has purchased an interest in Longines Kentucky Oaks (G1) contender Street Band, the partnership announced April 20.